For parents, there is probably one expense in particular that can send them into panic mode…and that is post secondary education. With all the media covering how expensive college/university is becoming and how it’s outpacing inflation by a large margin, it’s no wonder that parents worry about how their kids will pay for school. While some parents believe that the child should pay for 100% of post secondary education, there are parents who want to help out. I’m in the helping out camp – I’ll pay for tuition and books, but the student needs to pay for any extras. For our family, we decided to go the RESP route to take advantage of the 20% contribution matching that the federal government offers. That is, up to $2500 in annual contributions will be result in a grant of $500 deposited right into the account. So that’s exactly what we do, we contribute $2500 per year invested in a diversified low cost mutual fund portfolio for the RESP. Ok, enough about me, this post is about a new book that a blogger colleague, Mike Holman of Money Smarts Blog, has written titled “The RESP Book” (Amazon link). 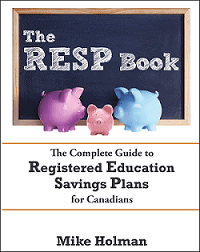 This book is a comprehensive guide to the RESP program in Canada and is a must read for any parent considering or even using the RESP. Mike Holman has worked in the Canadian financial industry for almost two decades. He runs the popular personal finance website MoneySmartsBlog.com which was nominated by the Globe and Mail as one of the Best Money Blogs in Canada. MoneySmartsBlog.com has also been featured in several newspapers across the country. A husband with two young children, Mike set up a family plan RESP for his kids. As previously mentioned, this book is a comprehensive guide to RESPs that spans from explaining how an RESP works, to opening an account, the to the types of investments to consider holding within the RESP. This book reads more like a manual and is jam packed with details. For example, when withdrawing from an RESP for a child attending post secondary schooling, did you know that you need to indicate how much of the withdrawal is from contributions (non-taxable) and how much is from accumulated income (taxable)? This presents some interesting tax optimization strategies depending on the income of the student during the specific school year. Perhaps one thing I would have liked to see more details on are the group/pooled RESP plans. From my initial inspection of these heavily promoted plans, they seem quite expensive. Even though I already have an RESP started, I learned quite a bit from reading this book and I would recommend it to any parent considering or even using the RESP. Contest will end Fri 5pm EST Oct 22, 2010 and the winner, drawn randomly from all entries, contacted shortly after! I like the province-specific sections. Hey FT, thank you so much for the great review. Made a mistake in choosing my first RRSP…went with CST and huge enrollment fees, need to do my research before starting one for little one #2.
great timing – i have a 3 week year old and was just starting to look into RESP’s! Good review FT, and nice work Mike! Thanks to blogs like this I avoided CTS etc, but I still don’t feel like I know much about RESPs. Might just have to pickup this book. As the father of a 4mth old currently looking into RESP plans I could really use this book! Even if you I don’t win the book, it would be great buy! If I don’t win the book, I will buy it. But, I’d prefer to win it! I got 2 kids going to schools so this book would be a must-read. Thanks. Sound like an interesting book. I have 3 kids… and would like to see if I am handling their education funds the way I should be. Have a 2-month old, looks like a great read! Sounds interesting. Sign me up. Count me in, I would love to have a read of this book. I would love to win this book as we are expecting our first child at the moment!! RESP sounds like a good deal. And the 20% contribution is not bad at all! As the mother of 5 kids, 2 currently in university, I would love to read this book to see if we are making the best use of our RESP’s. Just looking into family vs. individual RESP’s for my two…so far the family plan wins so I can save the $50/year on self-directed administration fee. Both plans are fairly flexible so I don’t really see any differences. Just saw this book online and was looking for a review – what luck! We are still awaiting the arrival of our first child which makes the timing of this even better.. looking forward to reading the book! Thanks for the review. Just about to become a parent for the first time so I’m newly interested in RESPs. From the review, this seems like it would be a good resource for research. I consider it high-praise that you learned something from this book! I plan on setting up an RESP for my grandchildren by the end of this year. My husband and I will be the subscribers, as for various reasons it is not a good idea right now to have the plans in the parents’ names. In other words, Grandparents should be reading this book too! We started an RESP for our little one. It would be nice to get more information before we have our second child. We have built up five figures in the first two and half year so far in the RESP. Count me in as based on contents should be informative. Good idea, more info will help. I’m in, I also pressed liked on facebook. Sounds like a worthwhile read. Thanks. I’d be interested to see what is in this book that isn’t generally available information on the web. RESP’s don’t seem to be all that complicated, so I’m curious. I’d love a copy of that book, if not by winning I’ll go a buy it. Great info! I don’t want to think of the cost of university in 15 yrs…. Just found out we will be having our first child in a few months so the timing of this is excellent. Looking forward to having a good read..
already working for one of major RESP company and still glad I never signed up with them! Count me in! I would get a better handle on the RESP! I would love a copy of this book. Thanks! Would love to learn more about the program, not only for myself-but to help out all the other new moms in my hometown! I would love this book! Thanks! wouldn’t mind a copy to read.. Looking forward to reading this book, too bad it’s not available in ebook format, otherwise I would purchase it already. Seems like an interesting read. Looks like a good read. Thanks for the chance to win. Count me in on the give away. Also in reposnse to “Perhaps one thing I would have liked to see more details on are the group/pooled RESP plans.” . . . He probebly gave them way more credit than I would have. I would sum them up in one sentance: Groups RESPs, they are for suckers; stay away!. I’m so grateful someone wrote such a book. We have an RESP but weren’t aware exactly what we were getting into (the group plan) so I’ll be eager to see what’s in here. Thanks so much! RESP R NOT FOR EVERYONE, IF I HAD MY WAY, I WOULD HAVE NOT SETUP ONE, INSTEAD GO FOR FORGIVEABLE STUDENTS LOANS THAT ARE AVAILABLE. MY WIFE’S IMMIGRANT FRIENDS R USING THE FORGIVEABLE LOANS & GRANTS THAT NONRESP HOLDERS CAN APPLY FOR….. I would really like to win this book because I am now retired after 38 years and decided to help others in insurance and investments, including RESP which I have had some experience on 2 of the three types with my own children and understand all three types. I know that there are still many things to be discovered, learned by me in order to share with others. Always up for more info. Any info on ‘over contributing’ to the RESP as a contribution strategy? With our first on the way, this is a must read! I don’t think I have seen many books on RESP’s, this looks like a book everyone should read. Parent or not. Amazon link has been added to the post for those interested in buying. Sign me up for a free book about getting some money back from the government. Would be a great read. My main concern with RESP is usually the lack of flexability of getting the money back if the kids do not go to university. Although I must admit, I don’t know as much about it as I would like. That’s why this book will be perfect. Thanks for the chance. I clicked the “Like” button on the Million Dollar Journey page. This book looks like it has a lot of really good information, relevant to our family. I would love the opportunity to win it. We’re lucky to have family helping us to start RESPs for our two little ones. However we’re still fuzzy on a lot of the specifics. Time for some focused reading. Thanks for the giveaway. I am really interested in this book. I already have an RESP for my son…but I would like to improve it any way I can. With baby #2 on the way, I definetly have some questions. I am currently finding out about RESP’s for my newborn, and would really like to read this book…everything to know all in one book. Thank you for the review. I have two kids – 10 and 3 years old – and no RESP yet. I hope the book will help us to start. I liked your FaceBook page and Look forward to the RESP book giveaway! I would really like to learn more about RESP’s. Can an RESP be useful even if you don’t have and never intend to have children? I was sucked into taking RESP from the providers like USC as soon as I had moved to Canada. We took a group plan for both of our kids. I had no idea that you could have a self-directed RESP too using TD e-funds or an RESP account at Questrade. Had I known it I would have done it all by myself. Now, due to their high fees (over 3000 or so per person) I feel like I am stuck with them and there’s no point in cancelling the plan now and starting something on your own at this point. I wish the government provided more information to unsuspecting immigrants regarding such plans offered by the providers. @ Scott, I dont’ believe you can open an RESP without the child being born first. However, if you have a niece/nephew/grandchild, you can open an account for them. I would like a copy of the book. Book sounds great – I’m in!! What a practical gift this would be for new parents – though I doubt it would garner the same oohs and aahs that most shower gifts get! Great timing! I have begun looking into RESP’s. i would like to read that book. I’ve been intending to start an RESP for my 9 1/2 month old for well 9 and 1/2 months. Would love to get a copy. book would be another wonderful addition! Would love to win a copy of this book. Like most new parents, I was bombarded by calls from the group RESPs soon after the birth of my baby – this book will go a long way in educating parents about their options! Anything helps to get ahead in life. Looks like an interesting book to read. Personally, I think that it would be foolish not to take advantage of the “free” money from our government if, as a parent, you want to help send your child to university. Interesting book. Count me in! This looks like a great book. We recently converted our individual RESP to a family one with the new baby, but I’m wondering if GICs are really the best choice this early in the game. I’d love some unbiased information! I would be very interested in winning this book. Count me in, please. Thanks! We started an RESP for our little one. It would be nice to get more information. Sounds like a very helpful book! RESP matters. We only have on child and we max out contribution.